Though five months of text messages between FBI officials Peter Strzok and Lisa Page remain unaccounted for, the 384 pages that were turned over to the Senate Homeland Security Committee last week indicate former Attorney General Loretta Lynch had advance notice that then-FBI Director James Comey would not call for criminal charges against Hillary Clinton. 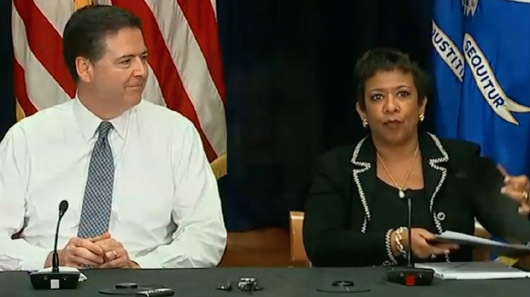 The new information “significantly diminishes the credibility of Lynch’s earlier commitment to accept Comey’s recommendation – a commitment she made under the pretense that the two were not coordinating with each other,” investigative journalist Sharyl Attkisson noted in a Jan. 21 op-ed for The Hill. One of the texts from Page to Strzok, which was released to the Senate Homeland Security Committee on Jan. 19, indicated that Lynch recused herself from the Clinton investigation on July 1, 2016 fully aware that Clinton would not be charged. Senate Homeland Security and Governmental Affairs Committee chairman Ron Johnson, in a letter to FBI Director Christopher Wray, revealed that he was notified by the Justice Department that the FBI “failed to preserve” five months of text messages between Strzok and Page – from Dec. 14, 2016 to May 17, 2017. May 17 was the day that special counsel Robert Mueller was named to lead the investigation of the Trump campaign’s alleged ties to Russia.